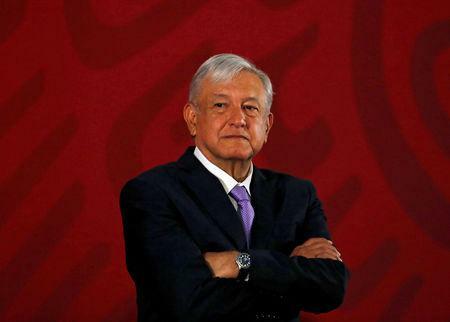 MEXICO CITY (Reuters) - Mexican President Andres Manuel Lopez Obrador said on Sunday the state had in the past been the main violator of human rights in the country, as he blamed violence and disappearances on his predecessors' "neo-liberal" economic policies. "There was a time in which the main violator of human rights was the state. It was the violator par excellence of human rights. That's over," Lopez Obrador said at an event in which his government set out plans to end disappearances in Mexico. "I, as president, and at the same time as commander of the country's armed forces, will never give the order to massacre, to repress the people of Mexico," he said. The violence has been punctuated by mass killings, some of which have drawn international condemnation of the Mexican authorities. Most notorious was the 2014 disappearance of 43 student teachers in the southwestern city of Iguala. The government said the youths were massacred after corrupt police handed them to a local drug gang, who incinerated their bodies. But many questions remain about the teachers' fate, and the incident did lasting damage to the reputation of Lopez Obrador's predecessor, Enrique Pena Nieto. Lopez Obrador, who took office in December, has sought to present his presidency as a complete break with previous administrations, and said he would not back a policy of "an eye for an eye" that tried to tackle "violence with violence." Homicides have remained close to record levels since the veteran leftist took power. The event set out plans to increase coordination between authorities, relatives and emergency services under a "national search system" designed to track down the disappeared. Lopez Obrador said the government would spare no expense in its efforts to find the missing, and to put names on some 26,000 unidentified bodies currently in storage. During his address, which was attended by relatives of some of the many disappeared, the president again attacked the economic policies of previous governments, saying they were corrupt, had impoverished Mexico and encouraged violence. "This is what we're suffering from," he said, "the rotten fruit of neo-liberal economics prescribed for 36 years."